It’s finally arrived! Tesla’s highly-anticipated Model 3 is here, and with over 130,000 preorders and counting, people are jumping on the Model 3 bandwagon. At $35,000, Tesla’s Model 3 is meant to bring the company’s electric vehicle technology to the masses. Tesla says the base vehicle will do 0-60 in less than 6 seconds, with versions that are able to go “much faster”. Range on the Model 3 is slated to be at least 215 miles, and will include support for Tesla’s high-speed Supercharging network, since “it’s about going where you want to go”, according to Musk. Tesla is hoping to have a total of 7,200 Superchargers by the end of 2017, when the Model 3 launches. Speaking of production – the Model 3 is not expected to begin production until the later part of 2017, and the first Model 3 recipients will be on the West Coast of North America, with deliveries then moving to the East Coast, and finally, overseas. A big change for Tesla is the touchscreen inside the Model 3 – the Model S has a 17-inch portrait touchscreen, while the Model 3 has a 15-inch landscape one. Autopilot hardware is standard, and all safety features will be active automatically, in addition to the Model 3’s 5-star safety rating all around. 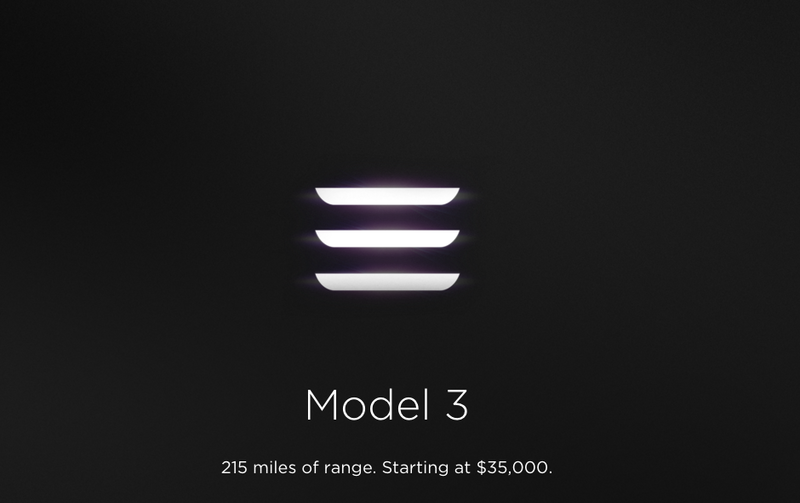 For a small downpayment of $1,000, Tesla will take your preorder for the Model 3. To cope with the increased production numbers, Tesla is planning to more than double the size of their dealership and service network by the end of next year. So, it looks like he’s well on his way with his master plan – we can’t wait to see the Model 3 on the roads! Watch the full video of the Model 3 unveiling at teslamotors.com/model3.